Cramp-Z is a revolutionary new way to stop painful leg cramps. Just spray it on your legs and rub it in. 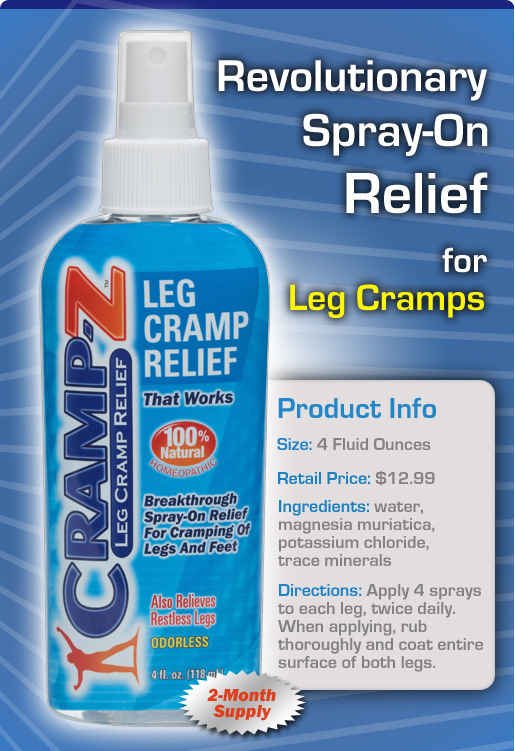 Cramp-Z is also great for muscle spasms and restless legs. And the best part is that Cramp-Z is 100% natural and homeopathic. So long leg cramps. "I used to get the worst leg and toe cramps every night. Since I have started using your product, the cramps are now gone!" "I regularly experienced charlie horses, spasms and twitches in my legs. I found that I can prevent them by applying your product liberally after a bath or at bed time." "During the past several weeks I have been using your product with excellent results. I have used other products in the past but your Cramp-Z allows for easier absorption. 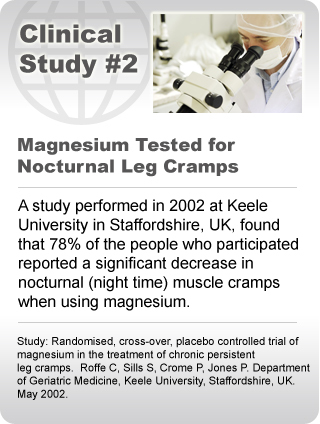 It decreases cramping in the muscles and allows for a better night's sleep." 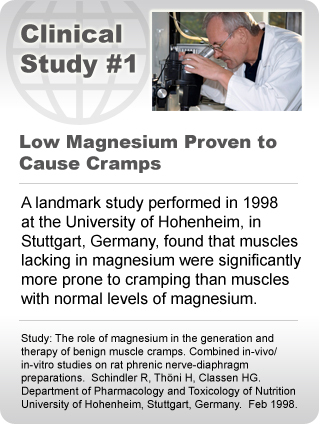 "I read a book entitled The Magnesium Miracle by Dr. Carolyn Dean, MD, and was surprised to find the number of symptoms that are related to magnesium deficiency. To name a few: muscle cramps, muscle spasms, muscle weakness, and the list goes on. I found your product online, purchased it, and after using it for two days, I no longer suffer from cramps or spasm. I am a living witness that your product does work."